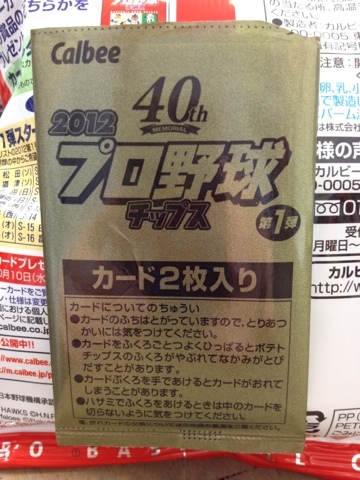 Pack busting: 2012 Calbee Series 1! While you fine folks in America are busting packs of the same old Topps flagship, Opening Day, and Heritage, I'm here in Japan stockpiling cards printed in a different language. I haven't talked much about my card purchases. Having a full-time job and spending the weekends poking around Tokyo and its environs while still keeping up with weekly laundry, cleaning, and cooking needs fills a lot of time. Plus, after spending all day working with the English language, I don't have much interest in using it to write posts! Plus, I don't have a comfortable way of typing up posts. I think I'm going to find one of those lap pillow table things and a cordless keyboard so I'm not hunched over like ... well, a hunchback. That might help my motivation, or at least my back problems. However, I haven't been avoiding cards or baseball in general! I wrote about my day with Kenny - who is coming back to Tokyo soon if he isn't here already. (Right, Kenny? Aren't you starting class in the next week or so?) I have visited a few card shops - mostly different locations in a chain called Mint. I have been focusing my efforts on the cheap singles for base sets and "insert" sets that are as common as the regular cards, though I have picked up a few cheap sets here and there and found some good bargains on a few of the better inserts. A recent pickup knocked out about 1/3 of the Calbee sets through 2007, so I think my first main goal will be to complete the Calbee type collection. And speaking of Calbee, as I posted yesterday, the Calbee cards have arrived in stores! While singles in stores run 50-100 yen each, a bag of chips with two cards is under 100 yen - a snack and two cards for less than they would cost in stores! Plus, I have a chance for the rarer insert sets. Kubo, the card I'm keeping. The fronts are in English! And the backs. Very little English here. It lukes like Kubo had a 1.17 ERA last year: not bad! At the bottom is the team logo and name, the player's jersey number, and his name. Did they steal this photo from a Prince Fielder card? While you can't tell because of my scanner's cropping, the cards have slightly rounded corners, making them much more durable in the long run. Is he pointing at a popup? Each photo is full-bleed. This is the kind of set I'd like to collect. Who knows, if I go crazy with the chip-buying (doubtful), I can collate my own set! The first insert I pulled (and I showed off yesterday) was from the Title Holders insert set. The set is currently 22 cards deep, and basically showcases leaders in various statistical categories. The fronts are very similar to the regular set, except for the set name at the top in place of the Calbee logo, and the background effect on the photo. The backs are different too. Note the different card number (most Japanese sets use some kind of prefix on the card number to identify the set, other than the flagship base issue). He isn't Japanese! It seems like many of the foreign players do well in Japan. Similar to the Topps deluge of reprints, the fronts are basically identical to the original issue. Cards have been resized to this year's dimensions (the 1975 issues were smaller) and there is a notation with 2012 and the card number at the top. Calbee did a similar reprint issue in 2007, but the cards were in a shadow "frame" that really identified it as a reprint. Also, the backs are essentially identical, with some change to the bottom. Older Calbee issues are very difficult to identify by year. For the most part, Calbee has followed a very simple basic design formula. The card number seen on the front and back "M-09" means this set is really called Memorial, though the literal translation of the set's name on the website is Reprint or Reprinted. The last insert card I pulled is from the flashy Starcard set. Each card has a foil background very much like last year's atomic refractors (if I remember correctly) or the gold parallels in Topps' flagship. There are 24 cards in this series, two players from each of the 12 teams. As I said, there's a foil/sparkle effect added to the photo. My scanner doesn't handle it too well, but you can get an idea of the sparkle "pattern" if you enlarge the scan. Note the insert set name at the top, the centered logo, team name, jersey number, and kanji instead of English across the bottom. And here are the backs. Again, note the unique card number and year. This kind of labeling really helps me determine what set I'm looking at while searching through boxes of random cards at the stores! Calbee has issued foil signature parallels of some of the insert sets in the past, along with background color variations. I have no idea if they are doing that this year - if you happen to have any information about parallels Calbee sets from 2008 on I'd be glad to have it! If you'd like to outright buy some Calbee chip packs, let me know - we can work something out where I send you only the card packs. It won't be terribly cheap (remember, each bag costs about 100 yen - $1.25 before any shipping costs). Just picked up a few bags of chips with cards on the back! See the pictures below for a preview. More to come later! The circle of life... and cardboard. This isn't a philosophical post. Instead, it's a post about some round cards! Holy menko, Batman! That's right. Batman menko. This is one of several cards I found in a little toy shop in Omiya. When I say little, I mean about as big as the average American bathroom. And it was jam packed with little toys and cards gathered from the last several decades. I could probably spend an hour or more just exploring all the goodies. Instead, I focused on the cards. I was quite happy to find a basket full of old menkos, including the Dark Knight above. Most of the menkos in the basket seemed to be from the same series, including this shot. I really enjoy the backs on menko cards, as there is so much to do! Here we have numbers (could be used for math games), a hand (for rock-paper-scissors), a die, another pointing hand, text, and even a separate line art drawing! Ack! Squid creature! Is this from Godzilla? Again, all kinds of neat stuff on the back! Train fans rejoice! I could probably ask someone who speaks Japanese (or at least knows a lot about Japanese trains) to identify the station. The backs on the train cards aren't so exciting, though it looks like there is a good bit of train data in kanji! I believe this is from the same series as the girl who fell off the table (?! ), even though there's a different picture in the middle. The cartoon artwork seems to be from the same show, too. Ack! Scary God-like creature with a lightsaber! With a deer-ear headband and wings! Blue skin! And a W-shaped hairline! Hrm. The girl looks quite angry and abusive, but it appears that mom is enjoying the massage. Hah! What an awesome pun! This is one of two cards from a larger-size menko set issued in 1976 that I bought for a couple hundred yen each. Nearly 6" in diameter, they feature color photos with the rock-paper-scissors symbol and a menko number on the front. And here's the second card. One of them wasn't listed in my book, so it could come from a different series or it might be uncataloged (at least it wasn't back in 2008). This card is even larger, also issued by Mitsuya in 1976. However, it seems that this larger-sized issue (nearly 10" in diameter) was produced in greater supply, as its "value" is less than the series above. However, I think I paid more at the store for this one. The checklists for each set vary. I picked up a few more cards (of recent issue) at the store, but you'll probably see those later. If you're interested in obtaining some menkos like these, please let me know ASAP. I've found another store in the Tokyo area that might carry some other non-sport menko cards and I plan on searching through their stock for some pickups. Also, I might return to the Omiya location and pick up more of those oversized baseball discs if there is some interest! Back to baseball (cards), and loose ends get tied. I haven't written a real post about baseball cards in a couple months now. If you've been following Chaos and Kanji, you've been able to keep up with some of my thoughts and travels here in Japan, and I'll try not to repeat myself too much here! First, now that I'm back with internet and such, I need to handle a little business. I left three "clearance" packages unmailed in America, and some people have sent me money since then. If you paid for your clearance cards and didn't receive them, please remind me! Send me an email (link through my profile page - rgluesing, gmail, you know what to do) and remind me what team you bought, your mailing address, and how you paid. The packages are already prepared, and I want to ensure that you get what you deserve! I can have them mailed from SF when your details get here. My internet was hooked up a week ago (I think? Time goes by so fast!) but between work and sightseeing I haven't had much time for writing. I haven't stayed away from cards though! I mentioned somewhere that I met up with Kenny (AKA Zippy Zappy) last month for an evening of card shop exploration and talk. He's one of the nicest guys you'll ever meet - above and beyond the politeness one would expect from a Japanese person! We worked out a trade before I crossed the Pacific, and his end of the trade was immense! He brought me a stack of 2012 Topps flagship - about 75 base cards and a few inserts. In fact, that's the first (and only) time I've had 2012 Topps in my hands! I didn't scan any of them, but I did scan a small selection of the Japanese cards he included. Overall, he gave me a 200-count box packed full of cards and a couple unopened packs. I was really happy with what he provided! After meeting in Shibuya and trading, we visited a card store (which I'll review later) and had dinner at Sbarro (mmmm, pizza). We headed to Shinjuku to check out another card shop (again, review coming later) before parting ways for the night. I think 99% of my Japanese inventory was purchased or received in trade that night (that is, until this past weekend). First, Kenny's "calling" card or trading card. I think it's really cool! 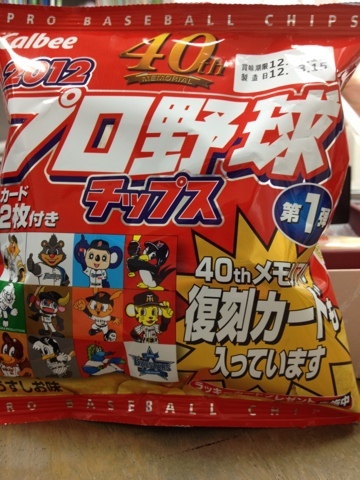 Calbee chip products contain cards like the one above during the baseball season. I believe the 2012 cards will be available by the end of the month! This is an insert or subset card from Calbee. I like the full-bleed photography seen on Calbee cards - a very simple design which focuses on what should be the best part of the card. 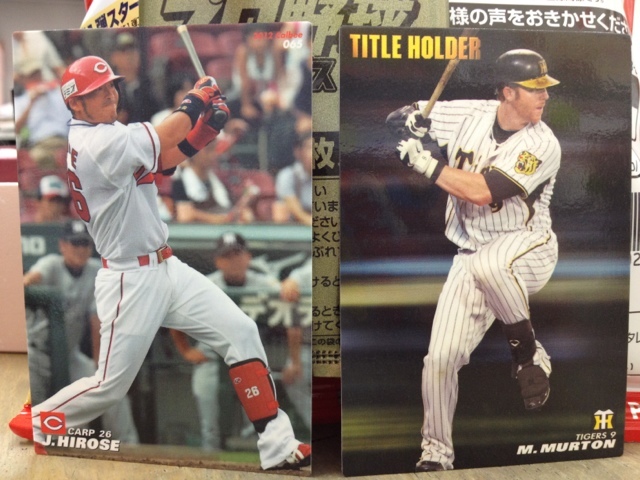 BBM is the "Topps" of Japan, and like Topps it's the only real manufacturer of baseball cards here. Each year's flagship has two versions (series) with different designs. Like Calbee, most of the designs focus on the photos. Some designs are more busy than others. See for example this insert, which is very similar to Upper Deck's style of insert. Hm. Same picture? Yep, it's on the back. There's a bit more to the design here, but again the cards are full-bleed. Press conference shots aren't too common on the Japanese cards I've seen. Though I can't remember the last time I saw a press conference image on an American card. And again, a different version of the base cards. Some of the inserts are shiny, and remind me of Playoff inserts of the 2000s (or Panini inserts these days). Wait. Topps? Kellogg's? Pirates? Is there an American card in the mix? Nope! Japanese players on American teams are featured in this cereal set (I think - correct me if I'm wrong!). And it really looks like a Topps issue - the design feels just like any other Topps card. Okay, let's close with a couple more BBM cards. Remember the 1990s Collector's Choice issues from Upper Deck? Well, BBM copied that concept with its silver and gold signature parallels found even today in flagship issues. Kenny's into American cards and American baseball, so I'm sure you can find something he might want in trade! He's working on the 1987 minis set from 2012 flagship and probably more (though he could have finished those already!). Oh yeah, and Kenny tossed in a bag of Butterfinger minis to remind me of home! I somehow still have one left for tomorrow - thanks Kenny, those little goodies really hit the spot! So that's it! Not my first card experience here in Japan, but the biggest card day in Japan until last weekend. I have another post for you Friday morning! So until then, thanks for reading!